One of the most common symptoms of dementia is disorientation. When seniors with dementia feel overwhelmed or confused, they tend to wander off and end up getting lost. Here are a few ways caregivers can prevent dementia-related wandering. Before you implement high-tech safety measures to prevent wandering, consider whether your senior loved one’s tendency to roam has an underlying cause. Wandering may be caused by stress or fear. When your loved one feels disoriented or overstimulated, he or she may wander away from the source of the discomfort and search for a safer environment. Wandering can also be caused by boredom or a need to follow familiar routines. When asked why they wandered off, many seniors respond that they were going to work or to the grocery store. Some seniors go off in search of a bathroom or a food pantry, and they forget where they were going before they get there. If your senior loved one has been diagnosed with a serious condition and needs help with tasks like meal prep, transportation, bathing, and grooming, reach out to Home Care Assistance, a leading provider of home care Portland, ME, families can trust. We also offer comprehensive care for seniors with dementia, Alzheimer’s, and Parkinson’s. If you can identify a pattern to your loved one’s wandering, you can find a simple way to prevent it. For example, if your loved one tends to wander at night, it may be a response to nighttime hunger. Putting a snack on the bedside table may stave off the urge to roam. If your loved one doesn’t follow a regular sleep schedule, the wandering may stop if he or she practices better sleep hygiene. Regular exercise can also prevent wandering, as it may leave your loved one too tired to wander in the evenings. 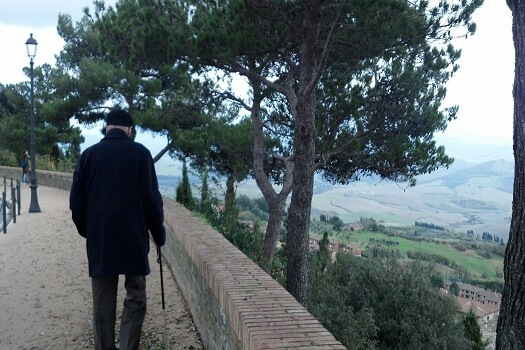 Seniors with a tendency to roam often leave the home and get lost outside. If you’re worried about outdoor wandering, equip your loved one with a tracking device. Radio transmitters are easy to wear, and they allow you to track your loved one’s location with a click of a button. Hiring a professional caregiver is one of the best ways to prevent your aging loved one from wandering. Portland senior care professionals can be a wonderful boon to seniors. Whether they require around-the-clock supervision or just need assistance with exercise and household tasks a few days a week, seniors can enjoy a higher quality of life with the help of trusted in-home caregivers. If your loved one wanders outside, you may need to install additional locks on your doors. Lock placement is important. If you install locks high up on the doors, your loved one may have difficulty reaching them. You can also place bells on the doors so you can hear when the door is opened. If you want a high-tech solution to wandering, consider placing motion detectors outside your doors. When the outer door is opened, you’ll be alerted. Installing motion detectors may be ideal for seniors who wander at night and caregivers who sleep soundly. Seniors with dementia should spend some time outdoors. The fresh air and sunshine is good for their physical and mental health. If you don’t want your loved one’s outdoor time to turn into wandering time, consider putting up a fence. Make sure the fence has a secure gate that makes it difficult for your loved one to wander away.